Director of Plant Operations is responsible for supervising the day-to-day operations of the plant right from the production stage to ensure that the stipulated policies and procedures are adhered upon. 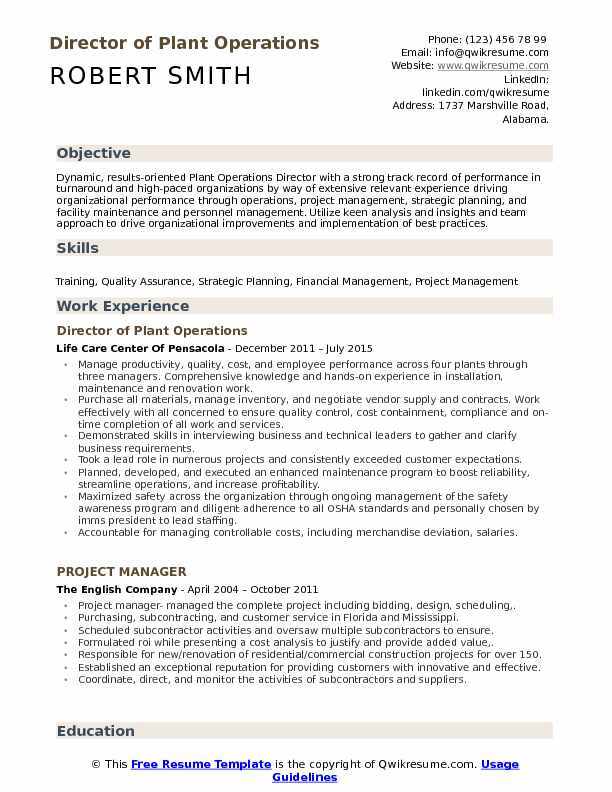 The job responsibilities commonly listed in the Director of Plant Operations resume include – planning, implementing and organizing projects relating to plant operations, managing the financial aspects of operations, taking accountability for overall operations and manufacturing of the product, taking responsibility for production output, allocating resources, monitoring operations and triggering corrective actions. 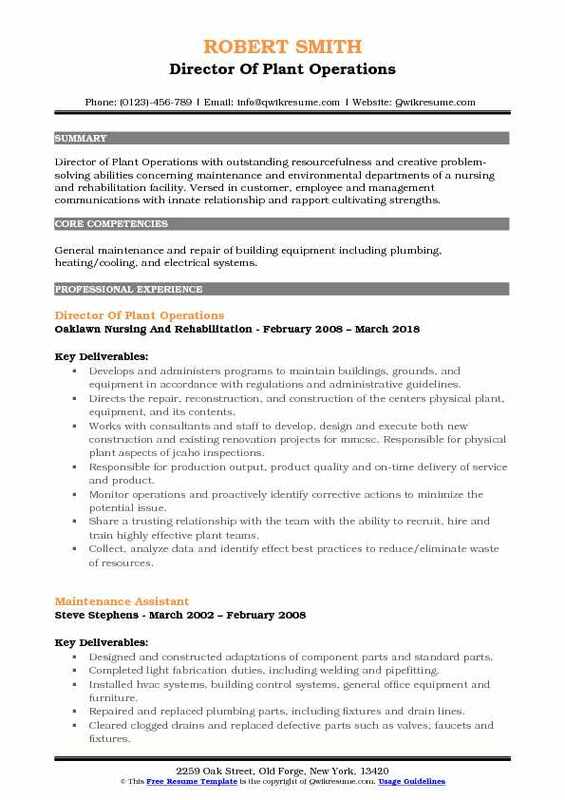 Candidates seeking this line of operations should mention throughout the resume skills and qualifications such as – adequate knowledge of various aspects of plant operations including strategic planning, budgeting, human resources and resource allocation; familiarity with safety and health standards, technical expertise, sound knowledge of quality, productivity, demand creation, and inventory; and computer literacy. A College degree in the related field is generally required for this post. Summary : Dynamic, results-oriented Plant Operations Director with a strong track record of performance in turnaround and high-paced organizations by way of extensive relevant experience driving organizational performance through operations, project management, strategic planning, and facility maintenance and personnel management. Utilize keen analysis and insights and team approach to drive organizational improvements and implementation of best practices. Manage productivity, quality, cost, and employee performance across four plants through three managers. Comprehensive knowledge and hands-on experience in installation, maintenance and renovation work. Purchase all materials, manage inventory, and negotiate vendor supply and contracts. Work effectively with all concerned to ensure quality control, cost containment, compliance and on-time completion of all work and services. Demonstrated skills in interviewing business and technical leaders to gather and clarify business requirements. Took a lead role in numerous projects and consistently exceeded customer expectations. Planned, developed, and executed an enhanced maintenance program to boost reliability, streamline operations, and increase profitability. Maximized safety across the organization through ongoing management of the safety awareness program and diligent adherence to all OSHA standards and personally chosen by imms president to lead staffing. Accountable for managing controllable costs, including merchandise deviation, salaries. Streamlined office processes to increase efficiencies and provide improved service. Developed. 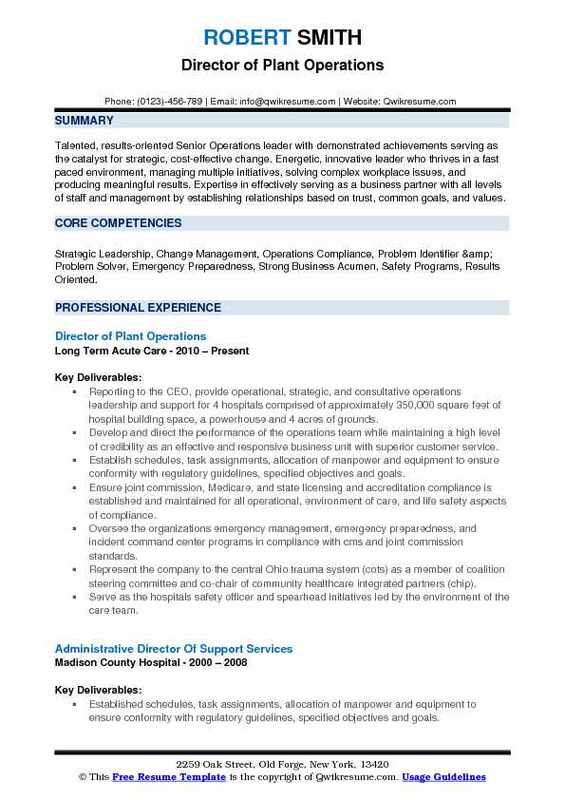 Summary : Talented, results-oriented Senior Operations leader with demonstrated achievements serving as the catalyst for strategic, cost-effective change. Energetic, innovative leader who thrives in a fast paced environment, managing multiple initiatives, solving complex workplace issues, and producing meaningful results. Expertise in effectively serving as a business partner with all levels of staff and management by establishing relationships based on trust, common goals, and values. Skills : Strategic Leadership, Change Management, Operations Compliance, Problem Identifier & Problem Solver, Emergency Preparedness, Strong Business Acumen, Safety Programs, Results Oriented. Reporting to the CEO, provide operational, strategic, and consultative operations leadership and support for 4 hospitals comprised of approximately 350,000 square feet of hospital building space, a powerhouse and 4 acres of grounds. Develop and direct the performance of the operations team while maintaining a high level of credibility as an effective and responsive business unit with superior customer service. Establish schedules, task assignments, allocation of manpower and equipment to ensure conformity with regulatory guidelines, specified objectives and goals. Ensure joint commission, Medicare, and state licensing and accreditation compliance is established and maintained for all operational, environment of care, and life safety aspects of compliance. Oversee the organizations emergency management, emergency preparedness, and incident command center programs in compliance with cms and joint commission standards. Represent the company to the central Ohio trauma system (cots) as a member of coalition steering committee and co-chair of community healthcare integrated partners (chip). Serve as the hospital's safety officer and spearhead initiatives led by the environment of the care team. Oversee the security and housekeeping contracted support services and troubleshoot service issues. Provide meaningful business reports and statistics regarding functional performance, issues, and trends. Recommend strategic changes for process and overall functional improvement regarding hospital operations. Provide consultative services to the leadership team and staff regarding operational and safety matters. 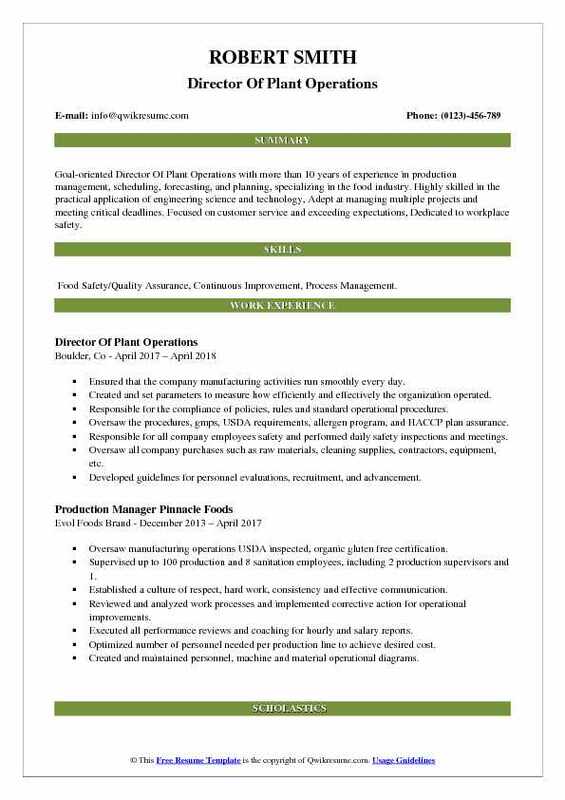 Headline : Goal-oriented Director Of Plant Operations with more than 10 years of experience in production management, scheduling, forecasting, and planning, specializing in the food industry. Highly skilled in the practical application of engineering science and technology, Adept at managing multiple projects and meeting critical deadlines. Focused on customer service and exceeding expectations, Dedicated to workplace safety. Skills : Food Safety/Quality Assurance, Continuous Improvement, Process Management. Ensured that the company manufacturing activities run smoothly every day. Created and set parameters to measure how efficiently and effectively the organization operated. Responsible for the compliance of policies, rules and standard operational procedures. Oversaw the procedures, gmps, USDA requirements, allergen program, and HACCP plan assurance. Responsible for all company employees safety and performed daily safety inspections and meetings. Oversaw all company purchases such as raw materials, cleaning supplies, contractors, equipment, etc. Developed guidelines for personnel evaluations, recruitment, and advancement. Monitored revenue margins and worker productivity, as well as implementing new directives for growth. Developed and implemented a production report to measure efficiency, increased production by 10.5% per year. Improved all sanitation and quality practices, reducing customer complaints by 20%. Implemented efficiencies resulting in a 30% reduction in utility costs. 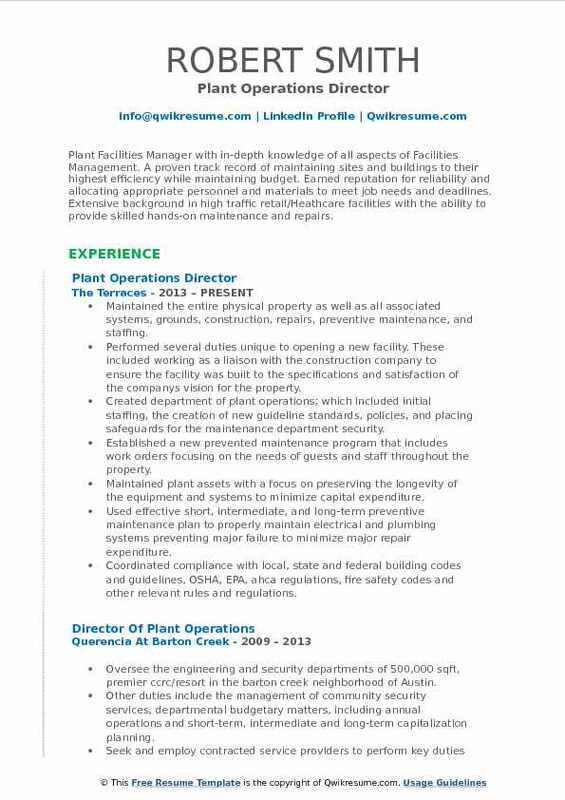 Summary : Plant Facilities Manager with in-depth knowledge of all aspects of Facilities Management. A proven track record of maintaining sites and buildings to their highest efficiency while maintaining budget. 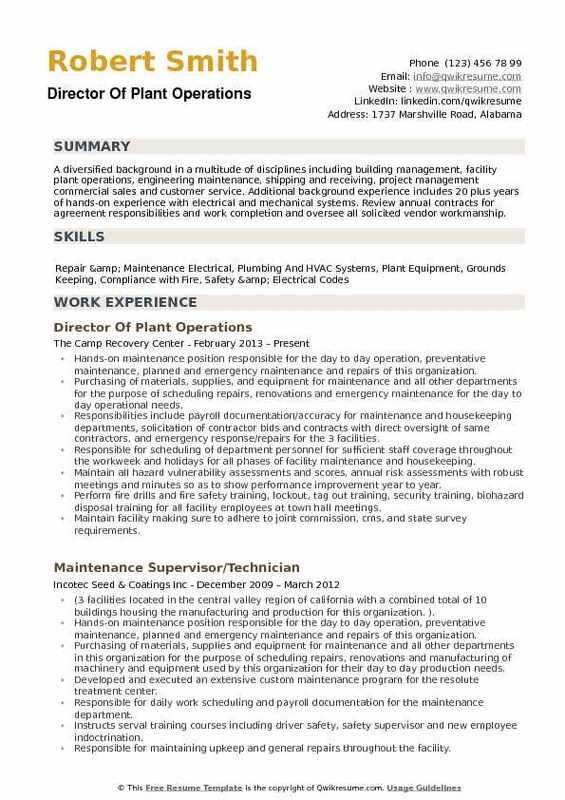 Earned reputation for reliability and allocating appropriate personnel and materials to meet job needs and deadlines. Extensive background in high traffic retail/Heathcare facilities with the ability to provide skilled hands-on maintenance and repairs. Maintained the entire physical property as well as all associated systems, grounds, construction, repairs, preventive maintenance, and staffing. Performed several duties unique to opening a new facility. These included working as a liaison with the construction company to ensure the facility was built to the specifications and satisfaction of the company's vision for the property. Created department of plant operations; which included initial staffing, the creation of new guideline standards, policies, and placing safeguards for the maintenance department security. Established a new prevented maintenance program that includes work orders focusing on the needs of guests and staff throughout the property. Maintained plant assets with a focus on preserving the longevity of the equipment and systems to minimize capital expenditure. Used effective short, intermediate, and long-term preventive maintenance plan to properly maintain electrical and plumbing systems preventing major failure to minimize major repair expenditure. Coordinated compliance with local, state and federal building codes and guidelines, OSHA, EPA, ahca regulations, fire safety codes and other relevant rules and regulations. Utilized energy management and tracking tools to maintain efficient utility operations and acted as liaison and primary contact for fpl and teco gas. Established standards and best practices in order to provide leadership and support to the entire community from the department of plant operations. Developed and established guidelines for the use of vendors with a focus on an effective balance between ensuring the quality of work or goods delivered by vendors and obtaining competitive bids. Defined and developed project solutions that are cost-effective yet fully compliant with operational needs for the resident's safety and care. Summary : As Director of Plant Operations of a continuing care retirement community, I was responsible for maintaining the facility, cottages, apartments, clubhouse, and pool. 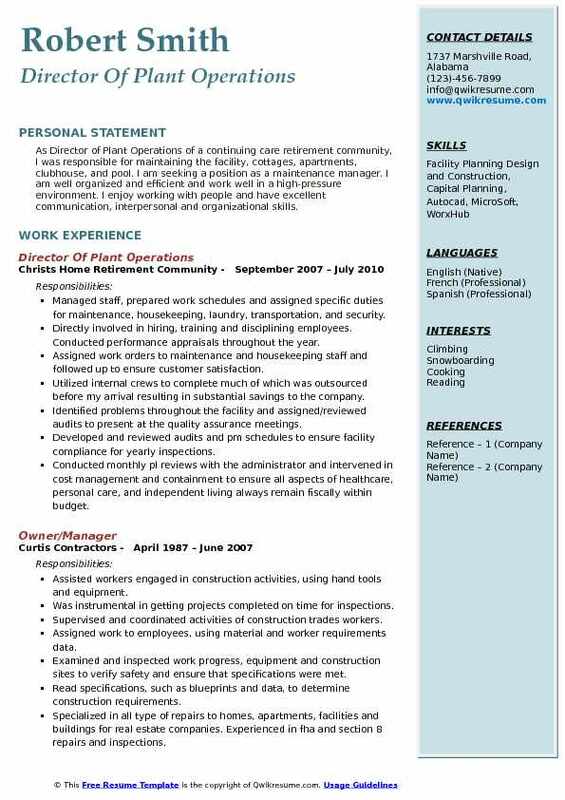 I am seeking a position as a maintenance manager. I am well organized and efficient and work well in a high-pressure environment. I enjoy working with people and have excellent communication, interpersonal and organizational skills. Managed staff, prepared work schedules and assigned specific duties for maintenance, housekeeping, laundry, transportation, and security. Directly involved in hiring, training and disciplining employees. Conducted performance appraisals throughout the year. Assigned work orders to maintenance and housekeeping staff and followed up to ensure customer satisfaction. Utilized internal crews to complete much of which was outsourced before my arrival resulting in substantial savings to the company. Identified problems throughout the facility and assigned/reviewed audits to present at the quality assurance meetings. Developed and reviewed audits and pm schedules to ensure facility compliance for yearly inspections. Conducted monthly pl reviews with the administrator and intervened in cost management and containment to ensure all aspects of healthcare, personal care, and independent living always remain fiscally within budget. Knowledgeable of federal and state regulations for long-term and personal care. Highly involved in life safety and department of health inspections. Fully responsible for running monthly fire drills and keeping records for inspections. Responsible for the safety and disaster committees. Chairman of the safety committee. Summary : Dedicated Professional with a proven record of success managing facilities and achieving high standards for maintenance and customer service Highly analytical budget conscious individual Enthusiastic leader with the ability to mentor and develop staff while maintaining compliance with organizations established policies, safety measures, and quality standards. Responsible for the maintenance, housekeeping, laundry services, transportation and security for an 84-bed rehabilitation center and long-term nursing. Responsible for scheduling and overseeing the work for a staff of 15 people. Made sure the facility meet all standards as outlined by nfpa 99 - healthcare facilities code, 101- life safety code and 80 - inspecting, testing and maintenance requirements for swinging fire doors. 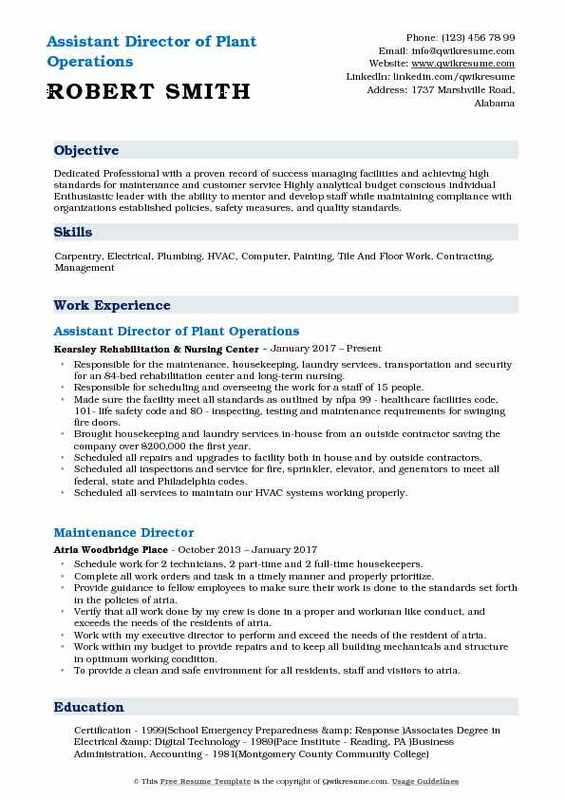 Brought housekeeping and laundry services in-house from an outside contractor saving the company over $200,000 the first year. Scheduled all repairs and upgrades to facility both in house and by outside contractors. Scheduled all inspections and service for fire, sprinkler, elevator, and generators to meet all federal, state and Philadelphia codes. Scheduled all services to maintain our HVAC systems working properly. Overseen a complete renovation of the entire short-term wing while still keeping the area in operation for residents. Negotiated the contract for, scheduled and overseen the replacement of a new cooling tower project. Negotiated and delivered contracts for elevator service, landscaping, snow removal, and septic system cleaning. 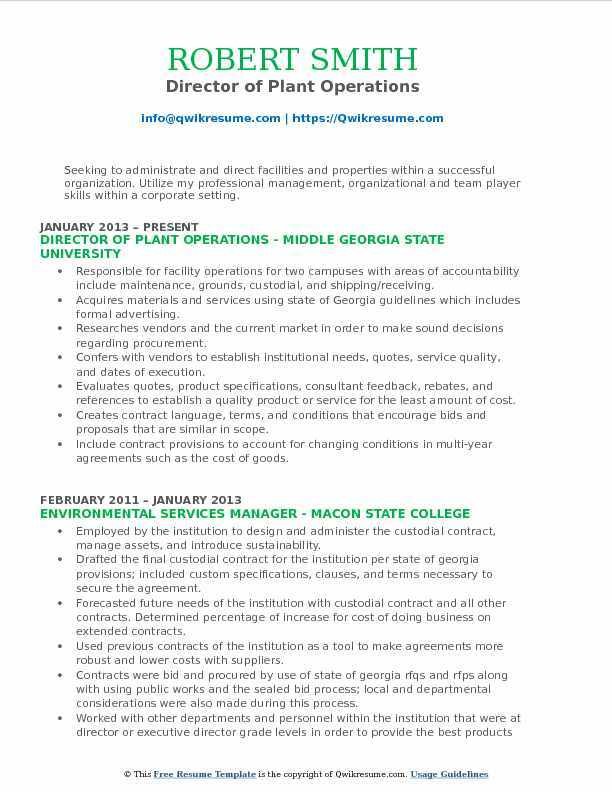 Summary : Seeking to administrate and direct facilities and properties within a successful organization. Utilize my professional management, organizational and team player skills within a corporate setting. Skills : Project Management/planning, Facility/Operational Management, Problem Resolution, Contract Negotiations, Customer Relations. Responsible for facility operations for two campuses with areas of accountability include maintenance, grounds, custodial, and shipping/receiving. Acquires materials and services using state of Georgia guidelines which includes formal advertising. Researches vendors and the current market in order to make sound decisions regarding procurement. Confers with vendors to establish institutional needs, quotes, service quality, and dates of execution. Evaluates quotes, product specifications, consultant feedback, rebates, and references to establish a quality product or service for the least amount of cost. Creates contract language, terms, and conditions that encourage bids and proposals that are similar in scope. Include contract provisions to account for changing conditions in multi-year agreements such as the cost of goods. Award, negotiate, and monitor contracts; determine whether products and services remain acceptable to customers. Ascertain what or if a correct plan is necessary. Negotiated change orders and amendments to contracts as the need for them increased. Authorize purchase orders and sign requisitions on a daily basis for many contracts. Summary : Director of Plant Operations with outstanding resourcefulness and creative problem-solving abilities concerning maintenance and environmental departments of a nursing and rehabilitation facility. Versed in customer, employee and management communications with innate relationship and rapport cultivating strengths. Skills : General maintenance and repair of building equipment including plumbing, heating/cooling, and electrical systems. Develops and administers programs to maintain buildings, grounds, and equipment in accordance with regulations and administrative guidelines. Directs the repair, reconstruction, and construction of the center's physical plant, equipment, and its contents. Works with consultants and staff to develop, design and execute both new construction and existing renovation projects for mmcsc. Responsible for physical plant aspects of jcaho inspections. Responsible for production output, product quality and on-time delivery of service and product. Monitor operations and proactively identify corrective actions to minimize the potential issue. Share a trusting relationship with the team with the ability to recruit, hire and train highly effective plant teams. Collect, analyze data and identify effect best practices to reduce/eliminate waste of resources. Implementation of plant safety procedures ensuring the compliance with all health and sanitation standards. Summary : Performance driven professional with a distinguished career demonstrating consistent achievement of objectives, strong project leadership, maximizing team performance, sustainable improvements and focus in maintaining the highest level of ethical standards with a compromising dedication on quality. Most notably, at evaluating the organization's needs and the development of systems to meet the highest expectations, with successful follow up and proven track record of results. Skills : Mechanical Building Systems, Housekeeping Programs, Project Management, Space Planning, Construction Project Planning, Blue Print Reading, Preventive Maintenance And Sustainable Programs. Managed the day-to-day operations of the physical plant for three (3) long-term care nursing homes, one (1) long-term care community, one (1) assisted living residence, one (1) adult day center composed of 1.4 million sq ft. Led functional scopes that included maintenance, preventive maintenance of all mechanical equipment, construction projects, custodial services, grounds, security, life safety, contract management, recycling and pest control. Supervised the daily operations of all service contractors, (42) ftes, (2) maintenance managers, and (2) environmental managers. Supervised and monitored all buildings HVAC, electrical, fire prevention, security, and life safety systems. Managed total operating volume of $11 million dollars which included all capital project planning and energy efficiency initiatives. Developed and established effective use of departmental policies and standard operating procedures in compliance with regulations, and requirements under local, and njdoh guidelines. Oversaw all mechanical and construction services and repairs agreements generated rfps, and negotiated contracts. Implemented HVAC preventive maintenance plans and conducted daily inspections of all major mechanical, building structures, and grounds. Summary : A diversified background in a multitude of disciplines including building management, facility plant operations, engineering maintenance, shipping and receiving, project management commercial sales and customer service. Additional background experience includes 20 plus years of hands-on experience with electrical and mechanical systems. Review annual contracts for agreement responsibilities and work completion and oversee all solicited vendor workmanship. Hands-on maintenance position responsible for the day to day operation, preventative maintenance, planned and emergency maintenance and repairs of this organization. Purchasing of materials, supplies, and equipment for maintenance and all other departments for the purpose of scheduling repairs, renovations and emergency maintenance for the day to day operational needs. 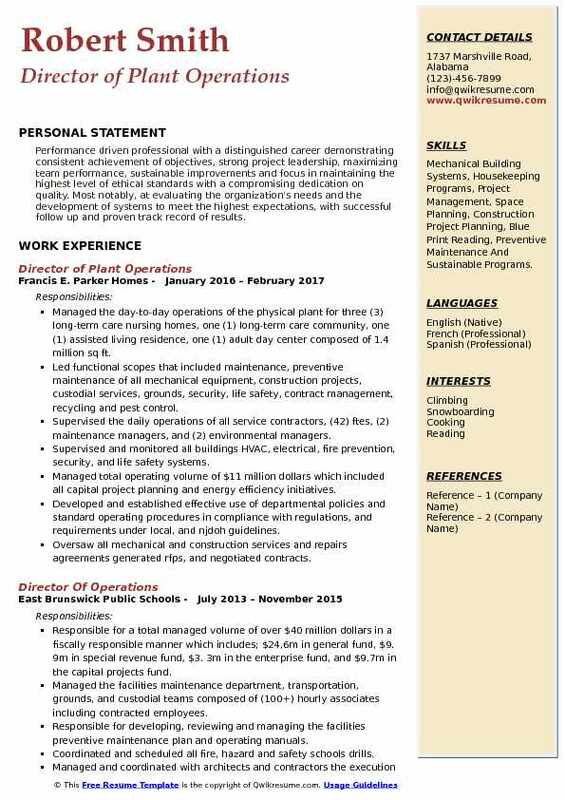 Responsibilities include payroll documentation/accuracy for maintenance and housekeeping departments, solicitation of contractor bids and contracts with direct oversight of same contractors, and emergency response/repairs for the 3 facilities. Responsible for scheduling of department personnel for sufficient staff coverage throughout the workweek and holidays for all phases of facility maintenance and housekeeping. Maintain all hazard vulnerability assessments and scores, annual risk assessments with robust meetings and minutes so as to show performance improvement year to year. Perform fire drills and fire safety training, lockout, tag out training, security training, biohazard disposal training for all facility employees at town hall meetings. Maintain facility making sure to adhere to joint commission, cms, and state survey requirements.